This 1911 farmhouse kitchen in North Albany has breathtaking views of mint fields and pastures below and Mt. Jefferson above. We designed the new kitchen/dining great room to be more open and connected to the adjacent family room, while maximizing natural light and taking advantage of the views. Several ill-conceived additions over the years created a disjointed layout that separated the kitchen from other family areas. 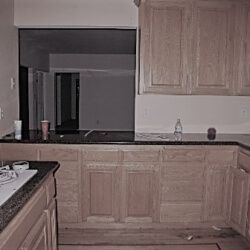 To reconfigure the space, we demolished the kitchen and several small rooms behind it (breakfast, laundry, and powder rooms) and built a small addition. The new great room integrates and visually connects the kitchen, dining area, and family room. 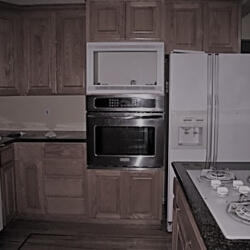 The functionality of this new farmhouse kitchen was greatly improved with two sinks, plenty of countertop space, ample cabinetry, and two concealed dishwashers (one next to each sink). A roomy walk-in pantry with an etched-glass door provides generous storage solutions. Together, these improvements make prep work and cleanup a cinch. 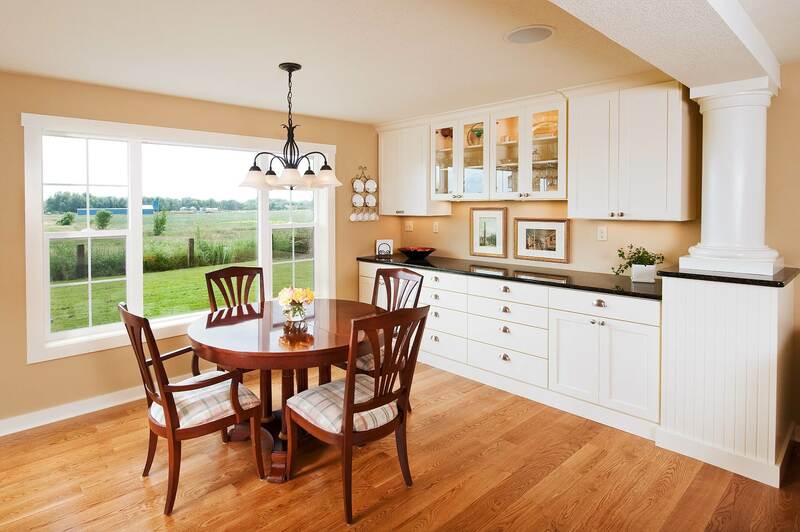 Windows were added along the entire length of the kitchen to improve natural lighting and take advantage of the views. 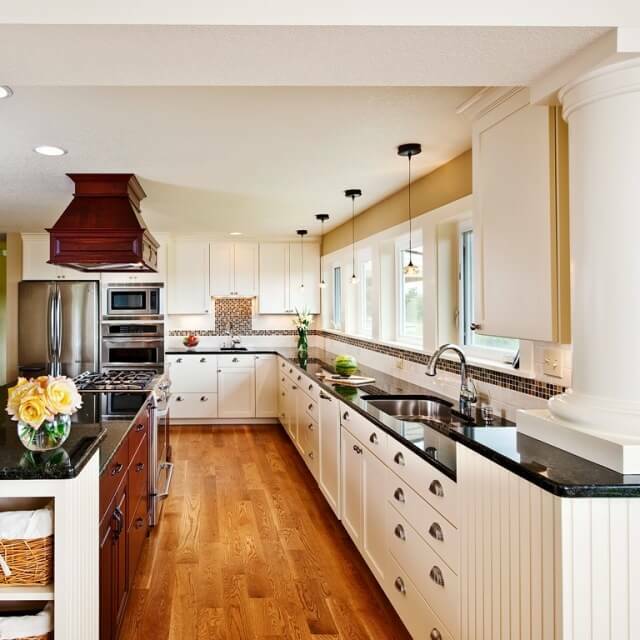 The new wall of windows allows light to flood the kitchen, making it feel bright and airy. 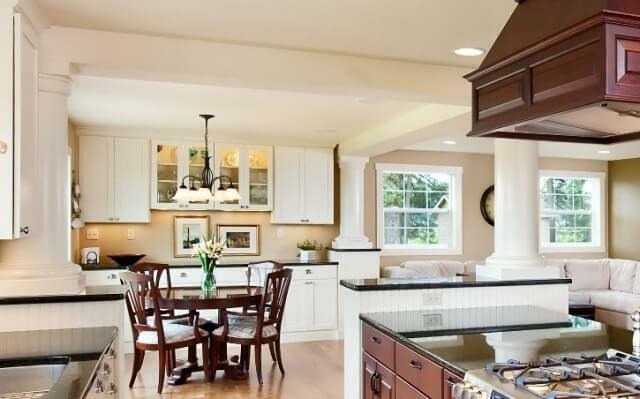 White window casings and cabinets around the exterior of the kitchen accentuate the light, bright feeling, while rich red Sapele cabinets in the island provide depth and visual contrast. 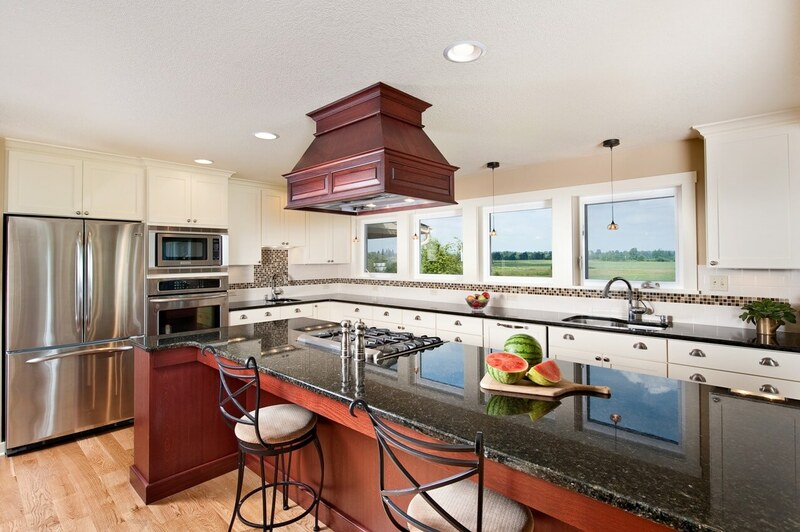 Granite counters throughout help tie the look together, as does the tile backsplash. 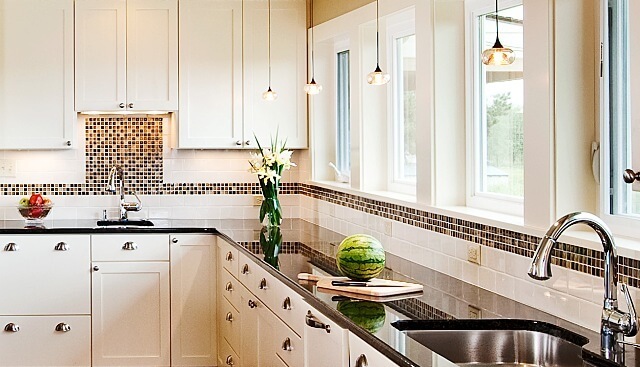 The white subway tile of the blacksplash echos the white cabinets, while the earth tones of the mosaic glass accent tiles repeat the colors seen in the granite counters, wood floors, island cabinets, and wall paint, creating a sense of harmony. 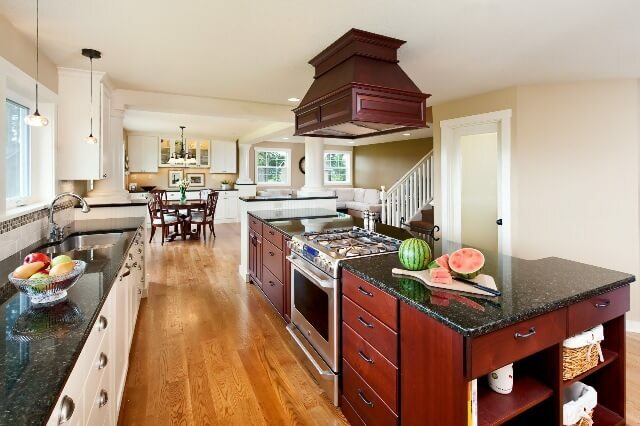 While the new island quickly became the centerpiece and hub of the new kitchen, an informal kitchen entry helps keep clutter from taking over. 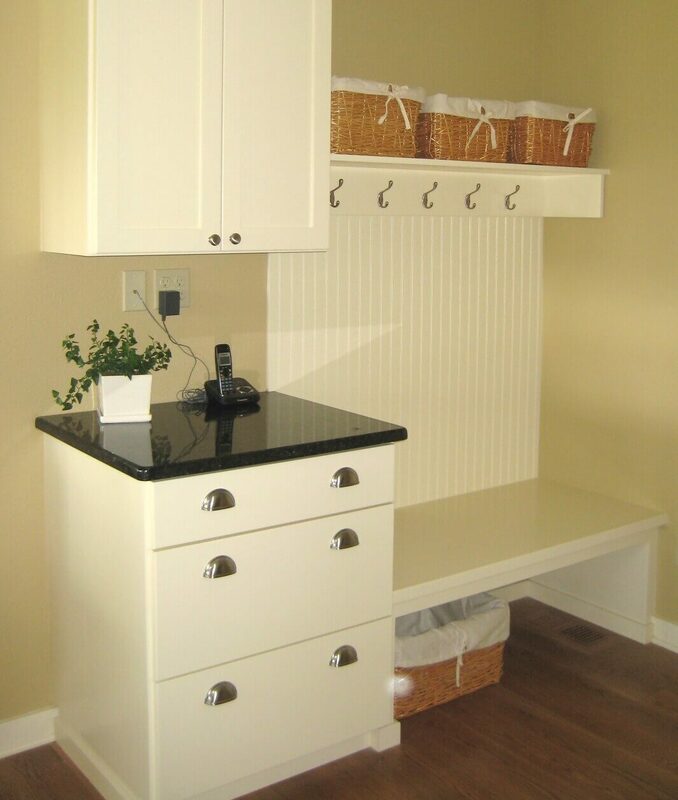 Drawers, baskets, hooks, and shelves provide a place for everything: mail, phones and phone chargers, coats, and shoes. In the dining area, a custom designed buffet with a lighted display case provides counter space for serving food and drinks, along with additional storage that is both convenient and beautiful. The beadboard inlay adds to the vintage feel of the farmhouse. This design meets all of the homeowners’ needs, and they were delighted by its WOW Factor!